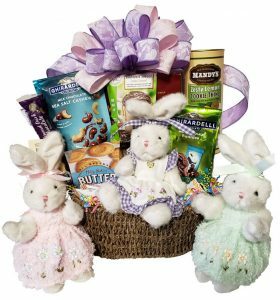 You will love the new Easter and spring themed gift baskets. They include the most adorable bunnies, some dressed up in embroidered chenille dresses, and some larger designer country bunnies. These gifts are decorated with the beautiful colors of spring, delicious new chocolates, and yummy new artisan appetizers and gourmet items! Other popular spring themes are gardening baskets, Sunday brunch baskets, tea baskets and picnic baskets. There are limited quantities and some items will sell out! Give us a call to arrange a custom designed Easter or spring themed basket today!